Ladies and gentlemen, here is This PC Tweaker. This application allows you to customize items inside the "Computer/This PC" folder. to add a new item to the Computer/This PC folder. You can put the shell localtion inside the "Folders" category or inside the "Other" category using the appropriate checkbox. This works in Windows 8 and Windows 8.1. 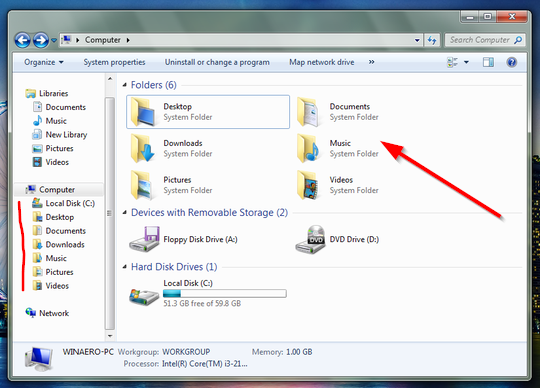 In Windows 8.1 you can show/hide Computer folder's items from the navigation pane of Explorer. You can remove any item from the Computer/This PC folder. 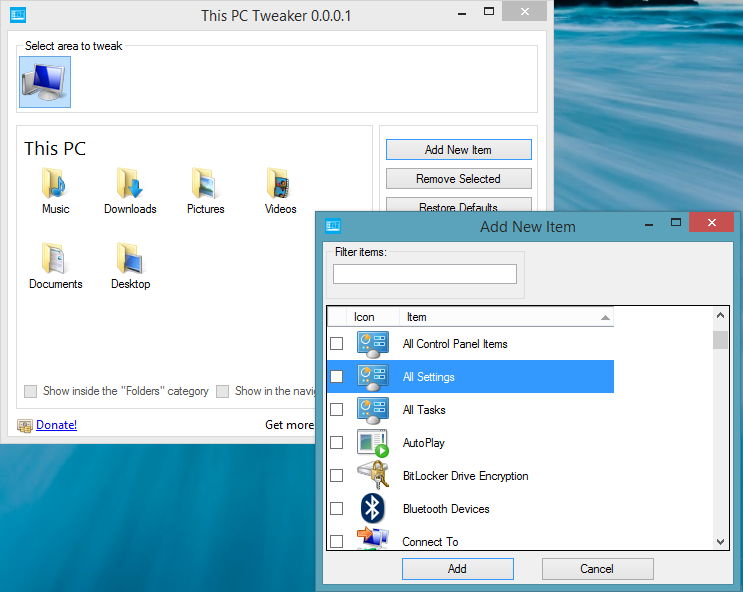 Currently This PC Tweaker supports Windows 8 and Windows 8.1 completely. However, i plan to provide full Windows 7 support and more customization options for the Explorer shell soon, in upcoming releases. Another useful application by hb860! Additional thanks for the front page. Villain, this feature is already planned for the next release. I plan to implement the full featured naviagation pane items editor. Fantastic work man. Saved it in my "hb860's tools" folder. Guys, I near the good implementation of the navigation pane editor part. I hope to release it soon. Thanks for making another great tweaker. Very useful! 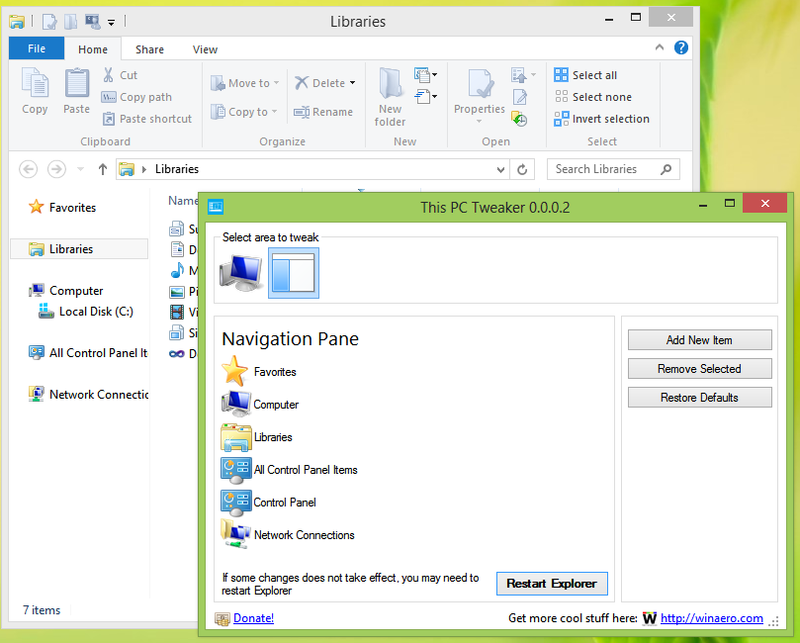 This app allows you to customize the Navigation pane of Explorer. You can add any shell location or remove any unwanted item. "Restore defaults" option is also included. Download link was not changed. Windows 7 user can try this app right now, if they install .NET 4.5. I will compile special Windows 7 version later which will use .NET version bundled with Windows 7. Control Panel customization to re-arrange it and add there all hidden applets. Your applications are useful. I'm sure a lot of people are using your app here. This version features full Windows 8.1 RTM support. 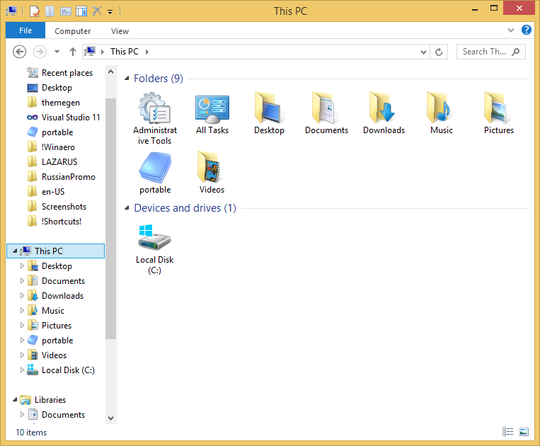 As you might know, 8.1 has "another" way to resolve folders inside the This PC folder. So I have changed the code. Also, now it works in Windows 7 too. I made few little changes and can claim that app has Windows 7 support However, I haven't compiled 'native' Windows 7 version (.NET 3.5 based one). I'll do it later. Initial release with This PC/Computer tweaking feature only. Version 0.0.0.3? How many releases have you planned? This is final release and it is not just good, it is WONDERFUL. Windows 8.1, Windows 8 and Windows 7 support is implemented. The separate version of Windows 7 is finally available. to add any folder to the Computer/This PC folder. Really any! * The application was rewritten from scratch. 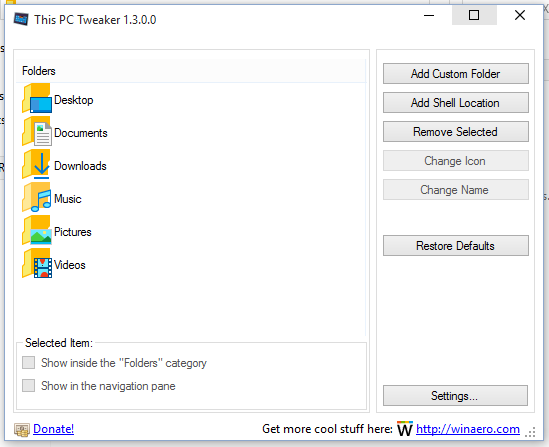 Note: the Navigation Pane editor feature was dropped from the RTM release of This PC Tweaker 1.0 due to bugs and stability issues. It will be released as a separate app very soon. I promise. 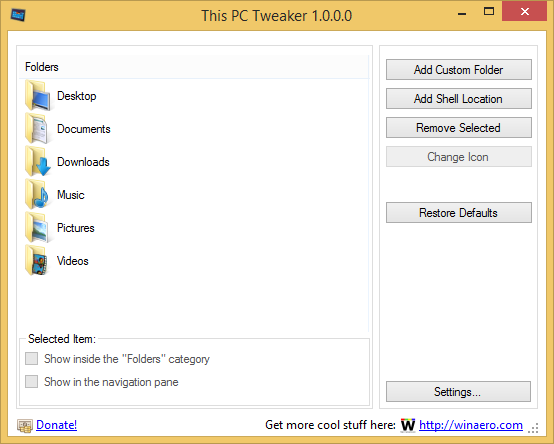 This PC Tweaker is still freeware, portable app. Enjoy! * Bug fixed: when you add a custom folder to This PC/Computer, the New Folder button inside that folder was not available. * Bug fixed: Removed shell folders like Downloads, Pictures may re-appear in This PC, if you add any of their subfolders. This PC Tweaker 1.3 with Windows 10 support.